You have xxxxxx credits in your account. You have xxxxxx text impressions in your account. Target: – this is the webpage the viewer sees when they click this text ad. Views: this is the number of times your text ad has been SHOWN. This is the number of VIEWS REMAINING. Enter the number of CREDITS you want to assign. Once you fill in the number of CREDITS, you must click the ASSIGN BUTTON at the bottom of that column to register those credits and calculate the number of views. You have xxxxxxx credits in your account. Once you fill in the number of IMPRESSIONS, you must click the ASSIGN BUTTON at the bottom of that column to register those impressions increment the number of views. 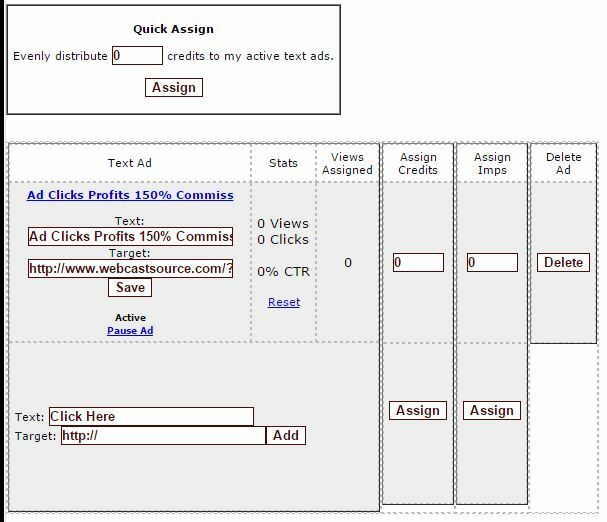 You have xxxxxx text ad impressions in your account. Click the DELETE button to completely remove that text ad from the system.